The latest Marvin Duchow Music Library (McGill University) exhibit explores the history of recorded sound through its rare collection of 20th century recordings and related ephemera. 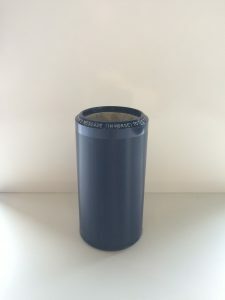 Cylinder, shellac, and vinyl records with varying disc and groove sizes, speeds, composition materials, colours and uses offer insight into the evolution of the medium. Recordings preserve the soundscapes of bygone eras but can also ensure a certain type of immortality. 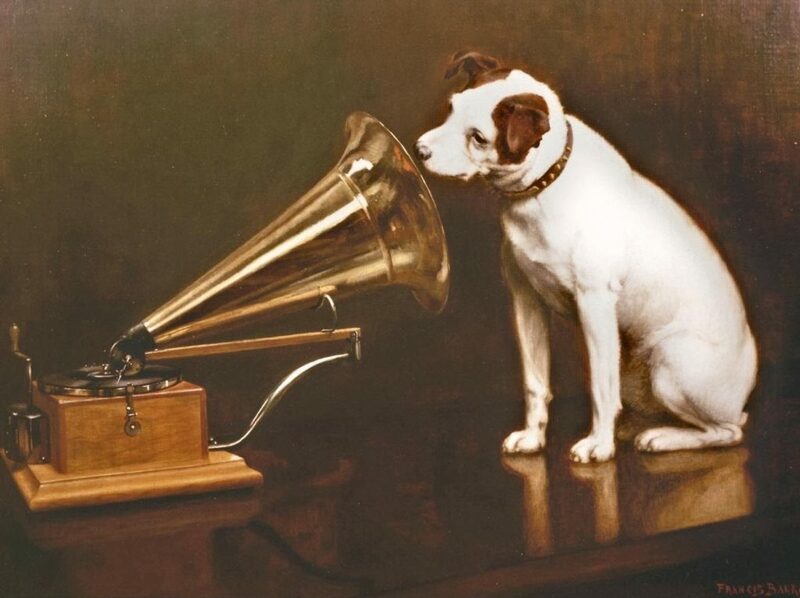 Nipper, the ubiquitous symbol of early commercial recording marketing, illustrates this point rather poignantly. Poised atop of what appears to be a wooden table, he is listening to sound or music through a gramophone. Upon further inspection, the table turns out to be a coffin and the only remaining evidence of Nipper’s master’s voice, is a recording. Thomas Edison was the first inventor to successfully record and play back sound on a tinfoil-covered cylinder in 1878. After experimenting with materials and playback technology, Edison released the earliest commercially-available recordings on cylinders as early as the 1890s. Blue celluloid with plaster of Paris core, 160 rpm, mono, 200 TPI (threads per inch), vertical cut. Mr. Edison’s Message (In Morse) to the Telegraph Fraternity. Thomas Edison. Edison Blue Amberol Record, 1920, cylinder. As Edison was working on the development of cylinders and phonographs, Emile Berliner was producing the first recordings on flat discs. The round flat disc would eventually dominate the market, and, as a result, Edison would cease production of his cylinders in 19291. 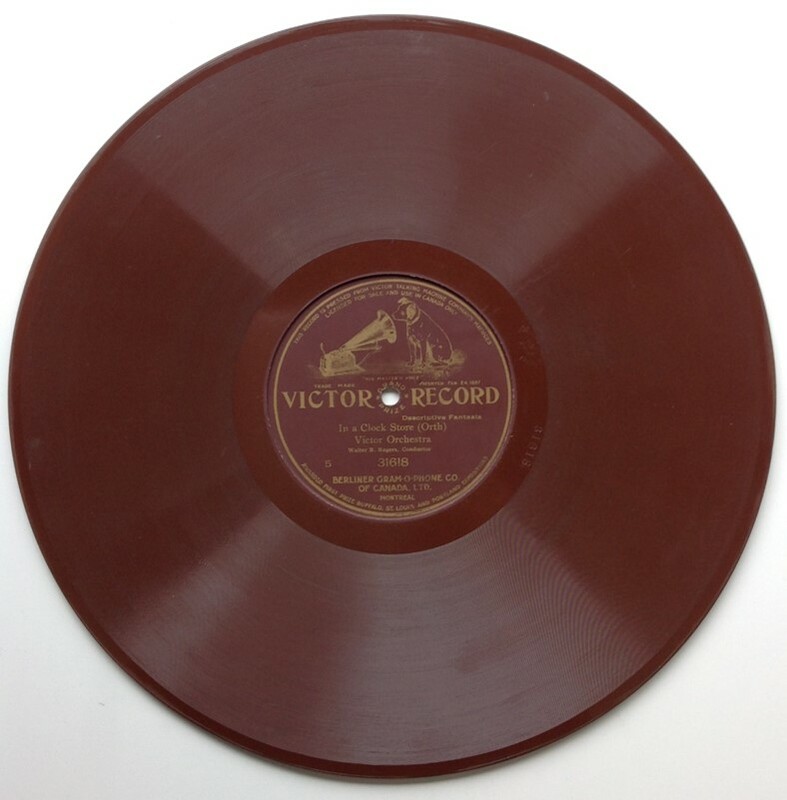 This 12 inch brown shellac record was released by Berliner Gram-o-phone Co. (Victor Talking Machine Company) circa 1907-1908. Note the use of brown shellac as opposed to the more common black colouring, showing early experiments with coloured discs. Also, this record is recorded on one side only, common to early 78 rpm recordings. Brown shellac, 78 rpm, mono, coarse groove, lateral cut, one-sided. In a Clock Store (Orth). Victor Orchestra. Walter B. Rogers. Berliner Gram-o-phone Co., Victor Talking Machine Company, 31618, ca. 1907-1908. Most discs are recorded with the stylus cutting lateral grooves (side to side), though some, such as Edison Diamond Discs, Pathé discs, and Muzak 16-inch discs have vertical, or” hill and dale” cut grooves (up and down). Edison Diamond Discs were not only produced using this type of groove modulation, but were also made to play at 80 rpm (revolutions per minute). Although 78 rpm would eventually become the standard, recording speeds varied considerably in the early days of commercial recordings. Also worth noting is the considerable thickness of the Edison Diamond Discs (6 mm as opposed to 2 mm for the average record). Condensite (resin varnish) with wood-flour based core, 80 rpm, mono, fine groove (150 TPI), vertical cut. Kahn, Gus, Albert E. Short and Del Delbridge. Beside A Garden Wall. Mering, Constance. 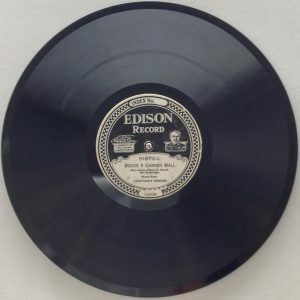 Edison Record, 11268, 1926. Cardboard with Durium acetate resin coating, 78 rpm, mono, coarse groove, lateral cut, one-sided. Vance, Howard. Old New England Moon. Phil Spitalny’s Music. 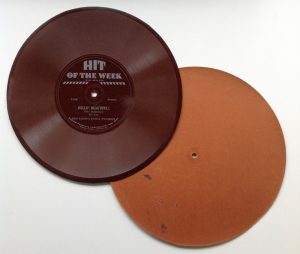 Hit of the Week, 1082, 1930, record. Donaldson. Hello! Beautiful! Sam Lanin’s Dance Ensemble. Hit of the Week, 1136, 1931. Flexible vinyl, 33 1/3 rpm, mono, microgroove, lateral cut, one-sided. Selections from Country & Western Music Jamboree. Reader’s Digest, Park Lane Recordings, ca. 1960s. Since the early days of commercial recording, record companies have used coloured discs (and cylinders) in order to gain a competitive edge in the market. While some used these discs to colour-code certain genres of music within their catalogues, others produced coloured discs for their visual impact alone. Produced during the Great Depression, blue shellac Columbia 78 rpm records were deployed to entice people to purchase recordings during difficult economic times. 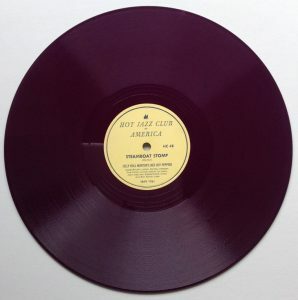 The purple 10 inch record shown here was issued by the Hot Jazz Club of America Record Company. 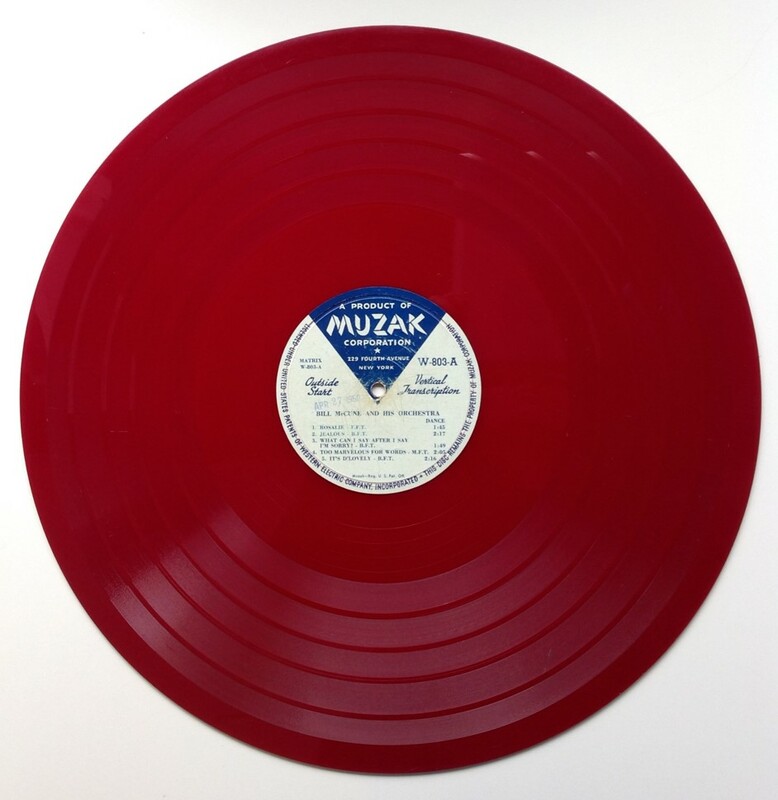 Not only is the colour rather striking but this record was made at a time when formats and materials were changing. Therefore, not uncommonly so for a record of its time, this disc is made of vinyl, but recorded at 78 rpm. 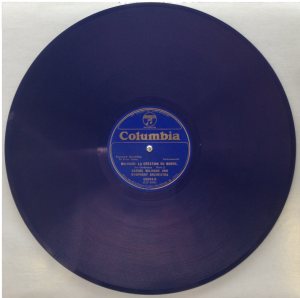 Record Blue Shellac, 78 rpm, mono, coarse groove, lateral cut. Milhaud, Darius. La Création du Monde. Darius Milhaud and Symphony Orchestra. Columbia, 68094-D, early to mid-1930s. Purple vinyl, 78 rpm, mono, coarse groove, lateral cut. Morton, Jelly Roll. Smoke House Blues. Jelly Roll Morton’s Red Hot Peppers. Hot Jazz Club of America, HC 48, recorded 1926, reissued late 1940s. Red vinyl, 33 1/3 rpm, mono, coarse groove, vertical cut. Bill McCune and His Orchestra. Muzak Corporation, W-803, ca. 1950s. Vinyl, 45 rpm, mono, microgroove, lateral cut. Symington, Williamson, and Kolgan. When the Ice Worms Nest Again. Wilf Carter and the Calgary Stampeders. RCA Victor, 48- 0139, 1949. Wieniawski, Henryk. Concerto No.2 in D Minor, Op. 22. The Robin Hood Dell Orchestra of Philadelphia. Mischa Elman. Alexander Hilsberg. RCA Victor, 49-3128, ca. 1949-1951. Kalitka (At the Garden Gate). Emery Deutsch and his Gypsy Orchestra. RCA Victor, 51-0025, ca. 1949-1951. Vinyl coating, paper illustration on aluminum core, 78 rpm, mono, coarse groove, lateral cut. McCarthy, Tierney. Alice Blue Gown. The Hour of Charm All Girl Orchestra under the direction of Phil Spitalny featuring Evelyn and her Violin. Sav-Way Industries, R725, 1947. 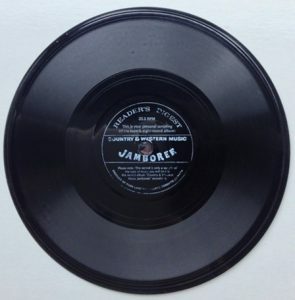 In parallel to the development of commercial recordings, home and “one-off” recordings were made increasingly accessible due to the development of portable disc-cutting lathes which allowed users to produce instantaneous discs. Although these types of recordings were most commonly made on lacquer discs, a number of other materials were used including aluminum. Given their composition, lacquer discs have a high risk of deterioration. Discs were often made by coating a fiber, metal or glass substrate with nitrocellulose. Over time, the castor oil used in the composition of the nitrocellulose coating could leach out, potentially causing a white film of palmitic acid to form on the record, and/or causing the record to delaminate5. Also of interest is the starting point of the playback. This record is to be played from the inside outward and can be found in both commercial and private recordings, though it is not nearly as common as the habitual outside start. This 10 inch transcription disc was produced as a “one-off” recording by the National Recording and Producing Co., located in the Willis Building (on the corner of St. Catherine and Drummond Streets), a former piano manufacturing plant in Montreal, Quebec. Lacquer disc with metal substrate, 78 rpm, mono, coarse groove, lateral cut, inside start. Narration. National Recording and Producing Co., ca. 1940-50s. Phonomenal! 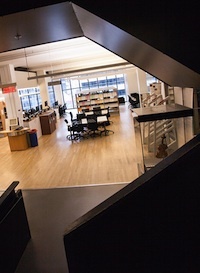 Rare sides from the history of sound recording is located at the entrance of the Marvin Duchow Music Library, 527 Sherbrooke Street West, 3rd floor. 2 Morton, David. Off The Record (New Jersey: Rutgers University Press, 2000), 175. 3 Granata, Charles L. ―The Battle for the Vinyl Frontier. 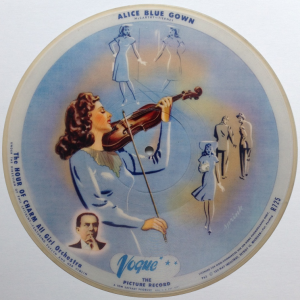 In 45 RPM: A Visual History of the Seven-Inch Record edited by Spenser Drate, 9. New York: Princeton Architectural Press, 2002.